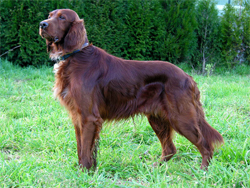 The Irish Setter is an elegant hunting dog that is highly intelligent and trains easily with positive training. 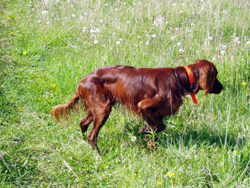 Originally the Irish Setter was used specifically for setting, or locating and pointing upland game birds. The Irish Setter is believed to have developed from an English Setter-Spaniel-Pointer-Gordon Setter mix. They can be a wide ranging gun dog with a good sense of smell. They have a fun loving, affectionate temperament. With the longer coat they do need some grooming. The Irish Setter's name in Gaelic is Madra rua or "red dog". 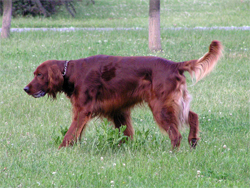 The Irish Setter was bred for hunting, specifically for setting or locating and pointing upland game birds. The solid-red Setter first appeared in Ireland in the 19th century, and in 1812, the Earl of Enniskillen declared he would have nothing else in his kennel. They are a tireless, wide-ranging hunter, and well-suited to fields and wet or dry moorland terrain. Using their excellent sense of smell to locate the mark (or bird), the Irish will then hold a pointing position, indicating the direction in which the bird lies hidden. The modern Red Setter is smaller than his bench-bred cousin. While show dogs often reach 70 lb, the working Red Setter is generally around 45 lb. The coat is less silky and the feathering is generally shorter. The color is lighter, with the working dog found in russet and fawn colors.